Maintaining an aquarium containing more demanding aquatic plants means not getting around a daily addition of liquid fertilizers. This can easily be done by hand. Another possibility - for reasons of convenience and consistency - is the automated fertilization using dosing pumps. This method is presented here in more detail. It uses dosing pumps, which are usually equipped with three or more channels and a control unit. For each channel, the amount of milliliters added, as well as the time and rate of addition, can be set individually via the controller. So you can easily perform a time-delayed fertilization of iron fertilizers and phosphate-containing components to avoid any precipitation. Even though our Aqua Rebell Mikro Basic Eisen is chelated so strongly that no issues with phosphate precipitation should come up. A certain, but still minimal, residual risk exists in weakly chelated complete iron fertilizers, such as Mikro Spezial Flowgrow. By setting the addition interval, you can divide a fixed dosage into several smaller portions, which are then usually distributed over 24 hours, rather than the entire amount once a day. This offers advantages, especially in the case of a complete iron fertilizer feed, since in this case the nutrients are more consistently available throughout the day. Also in case of problems with red algae such as BBA- or staghorn algae such a portioning can be helpful, if a one-time daily dose is too much and causes trouble with red algae. Each channel has two hose connections. The suction side is connected by hose with a container with fertilizer solution, the pressure side leads the liquid fertilizer into the aquarium. With each channel, you can individually control your own fertilizer component. With three channels, a sensible division would be e.g. : channel 1 for iron fertilizer, channel 2 for an NPK fertilizer and channel 3 for a pure nitrogen fertilizer. The various liquid fertilizers can either be filled into suitable containers or the bottles can be modified so that they become suitable for use with dosing pumps. The Arka acrylic containers are intended for the use with dosing pumps. First of all, the hose is connected to a fertilizer bottle. When using Aqua Rebell bottles, just drill a hole into the red cap and insert the hose there. Obviously the hole diameter should correspond to the hose diameter. A modded Aqua Rebell bottle. There should be as little give as possible between hose and caphole, to make the connection as good as possible, and at best airtight. If necessary, you can seal the point of entry with silicone or superglue. The hose should be long enough to reach the bottom of the bottle. 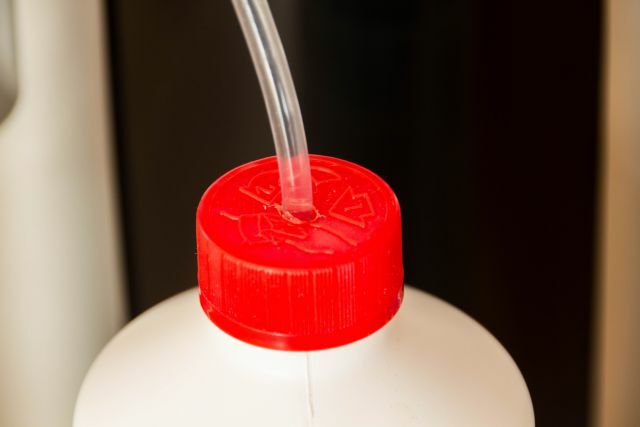 In order to avoid negative pressure in the bottle, the assembly requires a small air compensation hole. To do this, prick a hole into the top of the bottle with a needle. The hole should be up high enough to keep fertilizer from oozing out even when the bottle is full. An almost airtight sealing of the bottle (except for the compensation hole) is important to make sure that little oxidation as possible takes place inside the bottle. Otherwise, this might have a negative effect on the shelf-life of the liquid fertilizers used. So at best you should make sure to refill the bottles in time. If a fertilizer solution has already been consumed by half, it is advisable to do a full refill. 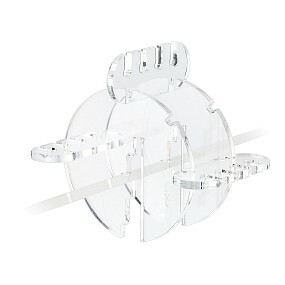 The tube holder from Arka. Some manufacturers offer suitable hose guides to make the introduction of liquid fertilizers easier. However, glassware from the CO2 department can also be (mis)used for somewhat more elegant solutions. This is covered in detail in this article. Important with the introduction of fertilizer into the tank is that the hose ends have no contact with the water surface. There are two reasons for this: On the one hand, it prevents the fertilizer from being mixed with water, thus affecting the shelf life and concentration of the fertilizer. 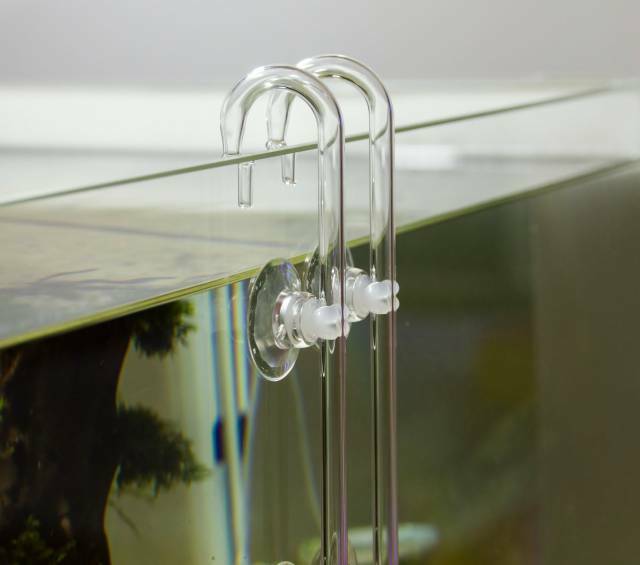 On the other hand it is prevented that in unfavorable cases the aquarium gets emptied via the hose line of the dosing unit (priciple of communicating vessels). Especially smaller planted nano-aquariums require only very small amounts of fertilizer. In unfavorable cases, even the smallest doses (1 ml) are already too much and certain elements accumulate too much, which under certain circumstances can eventually result in nutrient imbalances and algae problems. This can be the case, for example, with complete iron fertilizers, where an overdose may lead to an outbreak of red algae. A good remedy is to add smaller doses (drop by drop, e.g. with our Aqua Rebell dropper. But this again would be a manual, not an automated solution). Another possibility is to dilute the fertilizer solutions. 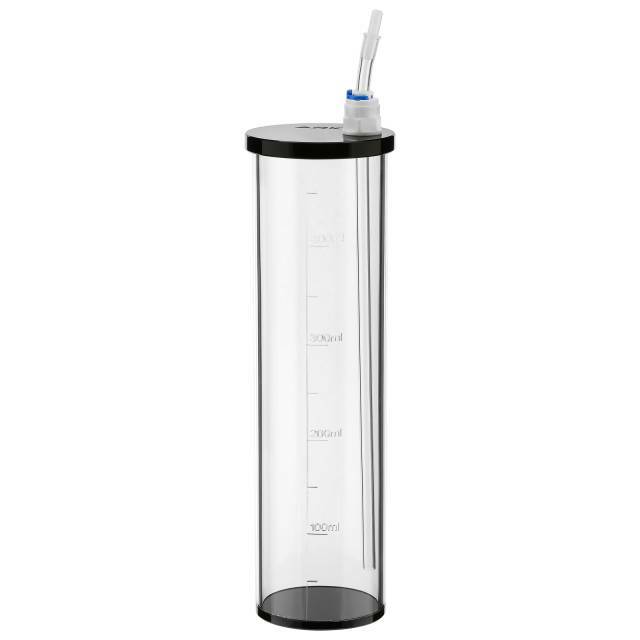 By diluting with demineralized water (for example in a ratio of 50:50), larger amounts can be added again, which makes possible the use of a dosing pump. However, it should be noted that this will also dilute the preservatives of the fertilizers, which may affect the duration of shelf life. In this respect, only smaller batches of such mixtures should be prepared. All in all, the use of the dosing pump is a constant and reliable solution, able to provide the aquscape with nutrients in a constant and comfortable way. Even longer absences such as holidays are no longer a problem.